When we decided we would be heading back over to Ireland this year for St Patrick’s day we wanted to make the most of our time on the Emerald Isle and not just explore more of the Republic but also take our first trip up to Northern Ireland. Here is a guide to transport options, how we made the trip up north and how to maximise your time and experience in Ireland! Dublin and Belfast are around about 103 miles apart so which ever method of transport you choose the trip shouldn’t take more than a few hours. Many people head up to the causeway from Dublin for a day trip, it is a good few miles from Belfast so does take longer but is totally doable. We wanted to explore Belfast itself though as well as the game of thrones scenic filming locations and the rugged coastline. We decided on taking the train up to Belfast as the time, price and timetable fitted really well with our schedule and budget. Dublin Connolly station is really central to the city and easy to get to being a 10 min walk from our accommodation just off O’Connell street. Belfast central however is a little further out from the city centre (well named) but with any train ticket you can take the short bus ride from the station to city hall for free. We bought our tickets online a few weeks before and also reserved our seats. However much like in the UK tickets are available on the day but may cost quite a bit more especially if travelling before 9:30am. We used the Irish rail website (www.irishrail.ie) which is easy and simple to use. Taking around 2hours and 10 mins. It was a quick and comfortable journey with free wifi on board and plug sockets to keep our phones and electronics fully charged. Hot and cold food and drinks were available too for a price much more reasonable than on the train down to London too. Considering it costs almost £15 for the short (but torturously slow 34 mile) train journey from Manchester to Liverpool this was a steal! People often say Ireland is expensive and we expected the train to cost far more than it did but we were pleasantly surprised! The journey seemed to fly by from the foggy docks of Dublin to the rolling Antrim countryside and rugged coastal ways. Crossing over the border from The Republic of Ireland over into Northern Ireland and the UK happened almost without us realising. Only the changing street signs and shift from green to blue station markers made us aware were had crossed over! There is a free travel agreement in place between the UK and Ireland so we suspected the border would just fly past however I do wonder how this has changed since the height of The Troubles. One of the interesting things to note, especially if you plan on taking the trip by car, is that in the Republic speed limits are marked in KM where as in Northern Ireland and the rest of the UK it is Miles! The journey by car should take just under 2 hours and the estimated petrol cost is about £18.00, but of course you also have to factor in the cost of renting the car in the first place! But this option is great if you want to stop off and admire some of the lovely spots along the way! Using the coach/ bus is probably only really worth it if you are travelling via the airports. There is also the option to take an organised tour up to Belfast from Dublin for the day. This will give you lots of information and you will likely see most of the highlights of the city but you will also not have the freedom to explore at your own pace and it will cost considerably more than the other options. However if you are limited on time or unconfident there are a great way to see Belfast. www.giantscausewaytours.ie – Best all around tour as it includes Belfast, Giant’s Causeway and Carrick-A-Rede. Is a long day and might feel rushed however and is a little pricey at €65.00 but if you only have a day to experience Northern Ireland from Dublin this is the one! Dublin and Belfast are both great cities and also really very different and contrasting. We love Dublin but think Belfast sometimes gets left out because of its past. Take the short trip up from Dublin and see the diversity that Ireland had to offer! Dublin on St Patrick’s day! Have you ever taken this trip and what would your best advice be? 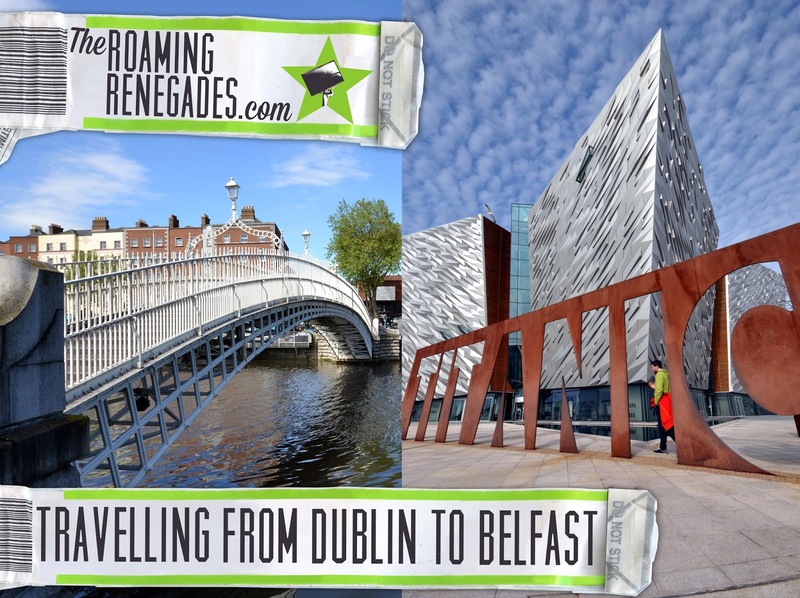 Bookmark this article How to get from DUBLIN (Republic Of Ireland) to BELFAST (Northern Ireland).